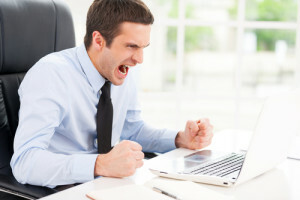 Digital anger happens to everyone. Whether blindsided by a rude comment or engaged in a chat that quickly heats up, there is no evading the feeling of wanting to yell at your inanimate screen before throwing it on the floor. Unfortunately, breaking your screen won’t erase the rage now bubbling inside you. The message remains and with it, your reputation’s future, for better or for worse. Due to such an inevitability, the best armor you can give yourself is learning how to deal with this situation as well as knowing how to contain the problem if you let your rage-filled typing get the better of you. Whether you’ve cussed out the little brat that insulted your family or you’ve been staring in utter disbelief at the quality of the insult flung your way, breathe. Just breathe in deeply and exhale slowly. Better yet, get out of your computer chair, put down your phone and go outside. Take a walk. Don’t put yourself anywhere near a device that gives you the power to respond. When you’ve been called out either correctly or incorrectly, you need to contain the rage to the privacy of your own inner turmoil, and this means only tackling a response when you’re in a calm, collected mindset. Exercise, even as simple as a quick walk around the block, gets your breathing regulated and fills your body with higher levels of dopamine, the chemical that makes you feel positive. Once this little burst of regulation is achieved, you can go back to the issue at hand knowing you can now look at it for what it is. Is it a critique? An insult? A poorly worded response? Figuring this out allows you to steer the direction of your response. If you did have a moment of rage that made its way online, immediately apologize for your rude behavior. This is a simple way to acknowledge that how you reacted was in poor taste and lets you take responsibility for your reaction. Following the apology, respond to the text that really got you mad in the first place. Exactly how you answer really depends on you and not who the other person is. Just because it might be some 13-year-old troll doesn’t mean they deserve any less respect than an adult trying the same thing. In fact, respect is how you stop the flow of hatred altogether. People tend to back off when they realize they won’t get any more angry responses. A good response is usually one that thanks them for their time sending you what they did and explaining why it either helps or doesn’t. If what was sent was offensive, ask them politely to not contact you again and block them. On the internet, no one can see your emotions behind the words. A full two-thirds of our complex means of communication is gone when we interact with people across social media, emails and chat. That’s why it’s important you retain your calm and keep any digital anger outbursts to a complete minimum. What someone types as a joke but is interpreted by you as an offense can quickly snowball into a destroyed relationship if you’re not willing to take a step back and truly analyze the situation before responding. If that’s not enough, remember that everything you do and say on the internet has been saved somewhere. Even if you go to recall a message or delete a tweet, the evidence is there. Keep responding negatively, and it will resurface as the internet continually reminds everyone that you’re a jerk. Just look at what’s happening with Donald Trump at the moment. Instead of addressing his immigration statements in a mature fashion on Twitter, he is going out of his way to insult those upset with his comment. This has led to nothing but more fuel for the fire and a large number of corporations pulling away from his empire. Everyone faces digital anger at some point. Though it’s not unavoidable, you have complete control over how you react to such situations. Be mindful of this because if you always put your best foot forward, you will easily become a highly respected figure that others will trust over those that have “moments”.